Journalism student Elsy Bejjani chronicles the university’s efforts to mark the centennial. Students pay their respects by lighting candles and laying flowers. 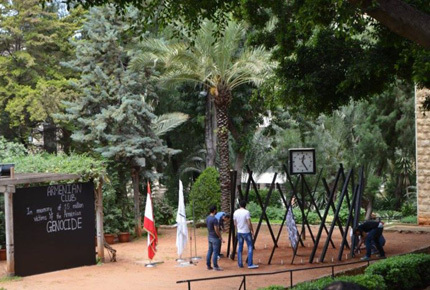 The Beirut club unveiled a modern reproduction of the Tsitsernakaberd, the Armenian Genocide monument in Yerevan, in front of Irwin Hall. Pope Francis set off a diplomatic firestorm this April by publicly calling the mass atrocities committed by Turks against the Armenians of the Ottoman Empire in 1915 a genocide. In response, the Turkish government – which claims that the acts of violence were inter-communal rather than a larger extermination plan – recalled its ambassador from the Vatican. Demonstrating its support to the large Armenian community in the country, the Lebanese government closed schools on April 24 this year to commemorate the centennial of the massacres. 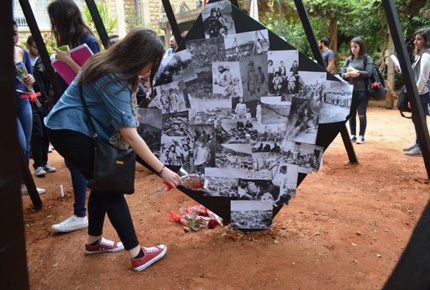 At LAU, the Armenian student clubs on both the Beirut and Byblos campuses spearheaded solemn memorial events to raise awareness about the Genocide and honor its victims. On March 23, the Beirut club cooperated with the School of Arts and Sciences to hold a talk by faculty member Katia Peltekian, titled “Political Interests Trump Humanity: The British Government and the Armenian Genocide of 1914-1923.” The talk was followed by an exhibition of newspaper clippings from that era from American, Canadian and the British press, reflecting the international uproar. On April 20, the Armenian club at LAU Beirut followed up Peltekian’s lecture with an event titled “What do LAU students know about the Armenian Genocide?” screening a short film of a dozen or so LAU students who were interviewed to test their knowledge on the subject. Later that same day, the club unveiled a modern reproduction of the Tsitsernakaberd, the Armenian Genocide monument in Yerevan, in front of Irwin Hall. Students laid flowers and lit candles around the monument, paying their respects to the Genocide’s 1.5 million victims.